Workday: Thomas Point – July 26, 2014 and August 9, 2014 – Chesapeake Chapter U.S.L.H.S. Volunteers also replaced the rusting screws on the two JELD-WEN door hinges; painted two new kitchen shelves with primer; returned the now working power washer motor to storage shed; cut two new landing deck boards, primed both and installed in gaps on landing deck, swept and straightened the work room and hauled away a lot of scrap lumber from the work room. 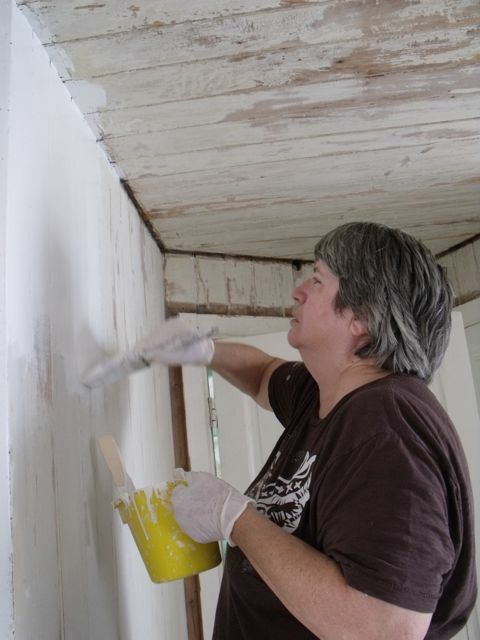 Cathy Lewis and Myma Pettaway replace rusty screws. L-R: Hobie Statzer, Myma Pettaway, Virginia Crespo, Bob Stevenson, Mary O’Keefe, Cathy Lewis and granddaugher, Tyler Kerschner, Bonnie and Ray Brown. 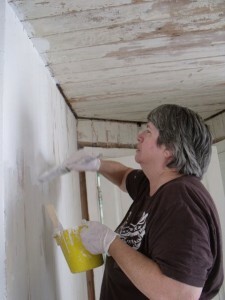 Virginia Crespo paints sitting room wall. 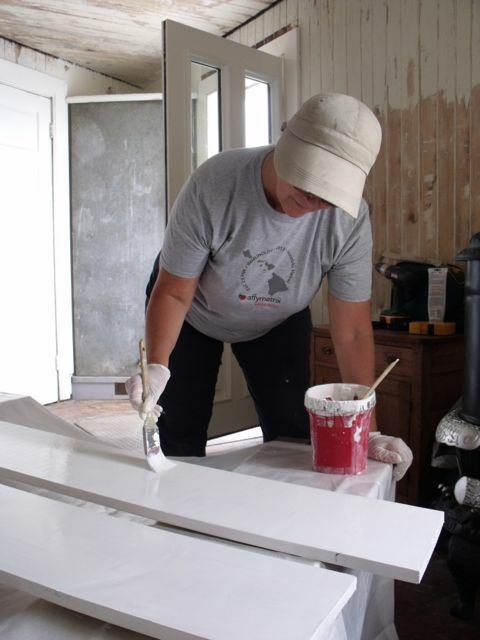 On August 9, nine volunteers returned for another productive workday. Four volunteers cleaned the ceiling and walls with cloths and applied a coat of white primer to the sitting room. 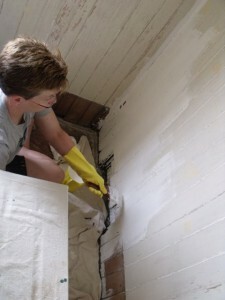 A small section of baseboard and quarter-round molding was removed. The floor in the sitting room was then swept and sponge-mopped. A third shelf was added to the kitchen pantry. Two lower deck boards, primed two weeks ago, received two coats of porch brick red finish paint. Several re-panted green shutters were re-attached. 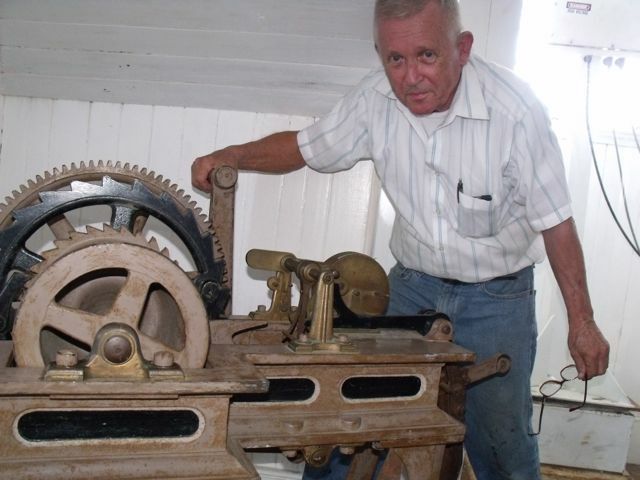 The railing posts where an old boat davit rested were re-enforced for greater stability and the old fiberglass screening over circular brass vents in cupola was removed and will be replaced. A plywood platform was constructed to allow volunteers to safely work on interior walls & ceiling of cupola (a future project). 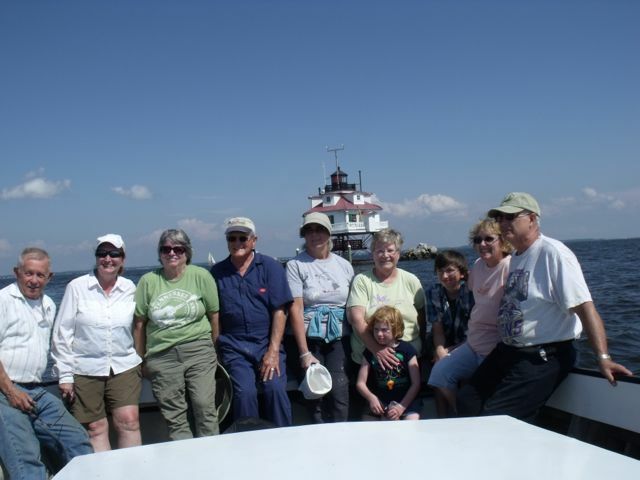 According to Tony the weather was good, warm and there were many boaters and fishermen near the lighthouse. 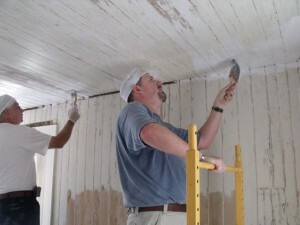 Ray Brown and Shawn Saez paint sitting room ceiling. 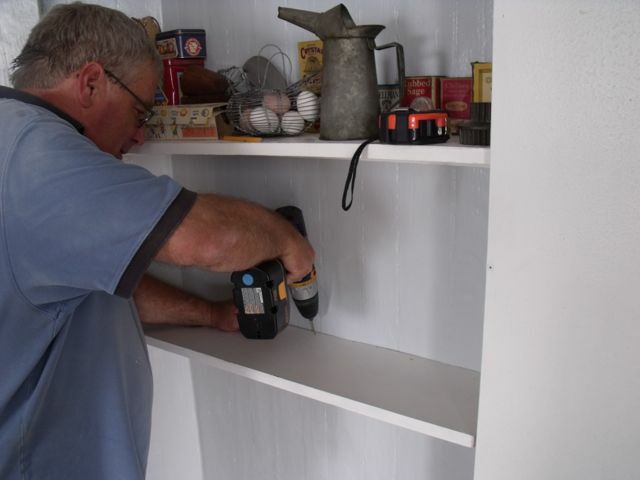 Steve Von Briessen installs third shelf in pantry.